Do you love watching cat videos online? A study at Indiana University reveals you're not alone, and may reveal the reason why. Feeling down? Want to feel better, get rid of negative emotions and have more energy? Watch some cat videos! It may actually make you more productive at work! If you're a typical Cat Lovers Only reader, you're addicted to cats. Yeah, go ahead, you can admit it. We all can admit it. We have OCD. Obsessive Cat Disorder. OK, so that's not really a thing, or maybe it is, I just haven't bothered to look it up. I do, however, want the tee shirt. If you're like the rest of us, when you see a kitten, either online or in purrson... you become jello. Sometimes you're a squeaking, screaming pile of jello. Covered in cat hair. What you may not realize, however, is that watching cute kitten videos may actually have a profound psychological effect on you. In a good way. "The Internet phenomenon of watching cat videos, from Lil Bub to Grumpy Cat, does more than simply entertain; it boosts viewers' energy and positive emotions and decreases negative feelings, according to a new study by an Indiana University Media School researcher. The study, by assistant professor Jessica Gall Myrick, surveyed almost 7,000 people about their viewing of cat videos and how it affects their moods. It was published in the latest issue of Computers in Human Behavior. Lil Bub’s owner, Mike Bridavsky, who lives in Bloomington, helped distribute the survey via social media." That explains all the positive feedback I get concerning cat videos, as well as my own experience. 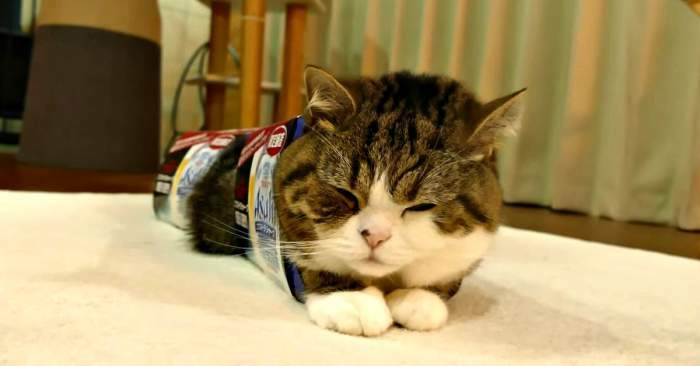 For example, watching Maru slide into the box always gives me a lift. Participants reported feeling more energetic and felt more positive after watching cat-related online media than before. The conclusion? If you're in a slump, have writer's block, feeling sad, or need to tackle a big important task... watch some cat videos. If you're at work, just tell your boss that you'll be even more productive in just a few minutes. Now, I'd like to know... do you notice a difference in your mood or energy level after watching cat videos?